More frozen stuff? Can you tell that I am still excited about my new ice-cream machine? You’d be right. 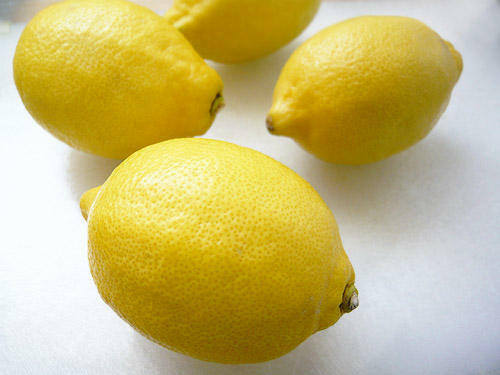 Today, it’s lemon time. Everyone has that one flavour they love and almost always choose when given a choice (at least in the summer). You might flirt with other flavours from time to time, but you always come back to that favourite. For me, I adore lemon sorbet. I like it to be fresh and zingy, sour, tart and lip-smackingly lemony. 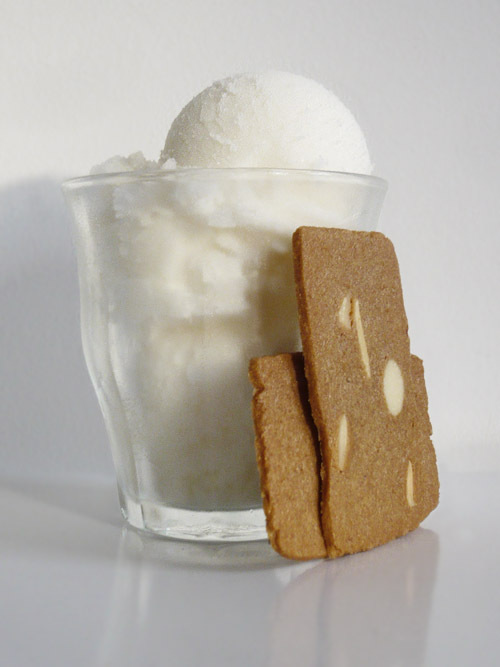 I have tried lemon ice-cream, but I always find it a bit of a poor substitute for sorbet. Lemon juice lends itself to cleanness and freshness, which is dulled when you try to make it using cream or milk. I could see how you could make a frozen lemon yoghurt, but if you’re after something sharp, sorbet is so simple and ticks all the boxes. Any now I can make my own! In this recipe, I wanted the flavour of the lemons to really come out. I got hold of some beautiful fresh lemons, and started off by zesting them into a saucepan – the idea was that this would get the zest as well as some of their essential oils. I infused the zest with the sugar syrup, allowed it to steep, then added the lemon juice at the end. I also tried to decrease the amount of sugar – this amount of liquid would usually take 500g sugar, but I managed to get it down successfully to 350g. Sweet, but not too sweet. I think using the lemon zest made a real difference – the syrup took on a light yellow colour, and there was a definite additional sharpness rather than just the tartness of the lemon. In the end, the colour did not really impact on the final result – it was a snowy white colour, but the stong taste of lemon was clearly there. All in all, I was really happy with this. 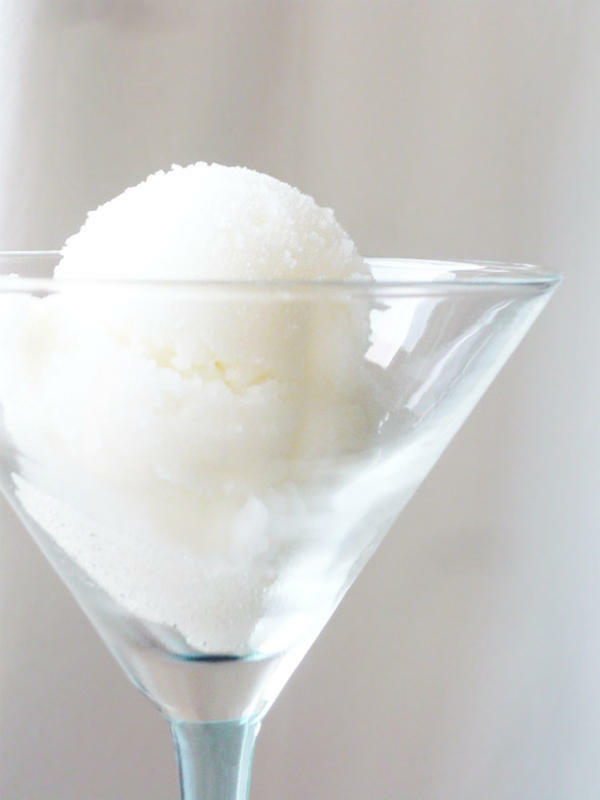 I love this sorbet as it is, but if you are looking for ways to jazz it up, you can try adding a handful of another aromatic herb to the hot syrup – mint, verbena, rosemary…or take the boozy route and top off with a shot of ice-cold limoncello or vodka. Grate the zest of each lemon into a saucepan. Extract the juice and keep it in a separate bowl. Keep going until you have 250ml of lemon juice. Add the sugar, water and glucose to the saucepan, and slowly bring to the boil. Cook for 30 seconds, then add the lemon juice, stir well, cover and allow to cool. Strain the cooled mixture to remove the peel. Freeze the sorbet in an ice-cream machine. Worth making? This sorbet is incredibly easy – if you are in a rush, or prefer a milder lemon flavour, you can omit the zest, and just combine sugar, water and lemon juice. I know this is getting repetitive, but I will also be making a lot more of this over the summer! For many years, I have coveted an ice-cream machine. I could have settled for one of those things you stick in the freezer, then remove and churn manually or get a little clip-on motor. But no, I wanted the serious thing, one that has a built-in freezer and makes lots of noise. Then, last week, I finally got one. Agonisingly, I had a few things to do and had to wait three long days to try it out. I think part of the fun of a new gadget is getting it home and using it right away. Anyway, my to-do list cleared, I spent all of Sunday trying it out. To start with, I made a champagne sorbet. Rather unusually, I had half a bottle in the fridge (I can assure you that “left-over champagne” is a rare occurrence in this house). The result was lovely. Smooth, light and quite boozy. In fact, I think I ate too much of it without thinking how much alcohol it contained. Satisfied that the machine worked, I got a little more serious and made a proper fruit sorbet using fresh English strawberries. I looked for small, bright red fruit, as the little berries are sweeter and more flavoursome than the giant varieties that are all talk and no action. Indeed, with strawberries, the smaller, the better. Think about wild strawberries – tiny, a lot of work to pick, but they have an amazing flavour. I made a sorbet as I actually prefer them to ice-cream. The flavour is fresher and lighter, and more suited to summer. 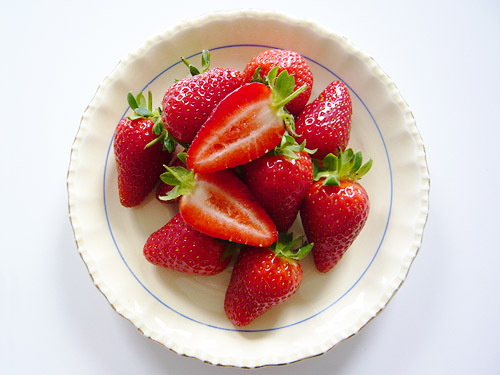 Strawberry is, in my view, one of the classics and really does bring a little of the summer sun with it. The recipe I used is really simple – make a sugar syrup, puree the strawberries, combine, chill in the fridge, then pop into ice-cream maker. After the machine did its thing (I left it in another room due to the noise), I got to try an utterly sublime result. 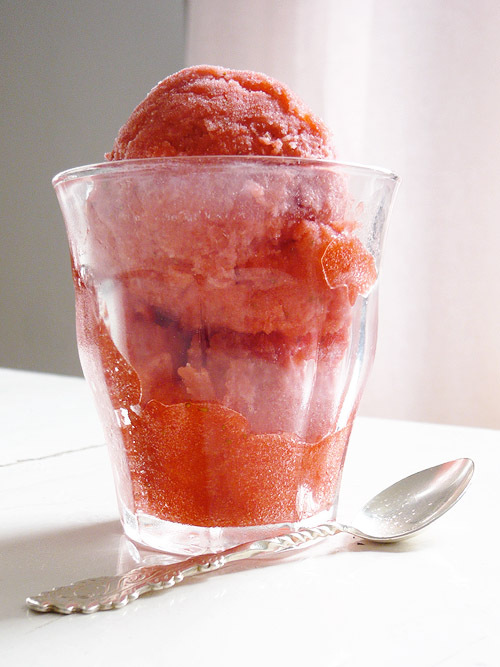 The sorbet is silky-smooth, with little bursts of intense strawberry flavour. The flavour was fantastic and the colour was stunning – a vivid, natural pink colour. It’s going to be a good summer. I just wonder how many frozen treats we can all take? We’ll find out. Put the sugar, water, lemon juice and glucose into a saucepan. Bring to the boil, then allow to cool. In the meantime, rinse the strawberries. Remove the stalks and hulls (if necessary), then puree. You can strain if you want to remove the seeds, but I didn’t and the result was great. Combine the puree and the syrup, and allow to chill in the fridge. 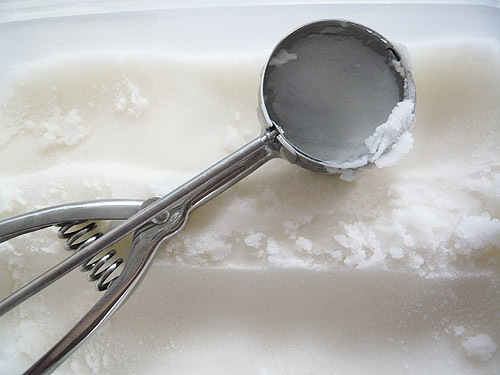 Place the mixture into your ice-cream maker and process until frozen. Worth making? Yes! This is one of the best sorbets I have ever had. The flavour is fresh, bright and intense. This is really worth trying, as it knocks a lot of commercial sorbets out of the water. I think I’ll be making this a lot over the summer months.